I was recently introduced to an amazing website called Chairish which is a site where design lovers buy and sell. They have such an amazing array of items to choose from. We all know how mid-century modern items have come back into design with full force. They can add such character to a space with their amazing lines and cool stories. I, personally, am all about this trend. So when I was contacted by Chairish to take a look at what they have to offer I just knew it was a perfect fit for me. Being able to use this site as a tool for client’s designs just makes me so excited. With me doing only E-design it can be tricky to find items with such amazing character through stores online. And then searching on Craigslist in the areas that my clients live can also be a dead end sometimes, so this is one more great resource for me to find those one of a kind pieces for my clients. 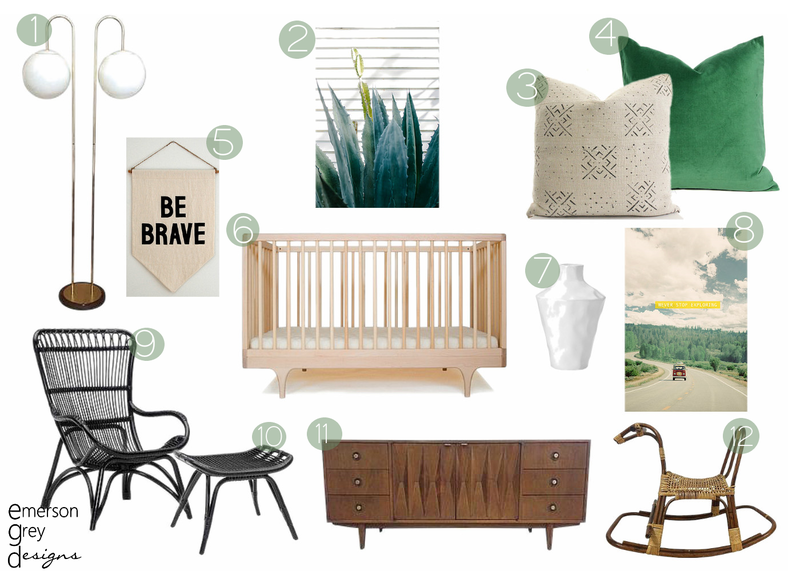 As I was cruising through Chairish’s mid-century specific items I fell in love with a few pieces and knew they would look great in a neutral nursery. A mix of wood tones, golds and emerald green makes for such a warm and rich space. Throw in some gender specific items like a wall macrame or weaving when your little one arrives and this space is done! For this design I incorporated five items from the Chairish website, all are linked below. I fell in love with the lines of the walnut dresser. Can you just imagine this in a nursery? Such a show stopper. And then this Swedish rattan and cane rocking horse just stopped me in my tracks, it is so special. Mixing these great finds from Chairish with some of my favorite pieces like Kalon Studios crib shows the progression of modern design from years ago until now. I also love how incorporating an item like an African mudcloth pillow can add such a mix of texture and style to this space. And why not incorporate a bit of velvet too, just to really amp up the luxury in this room. I truly feel like playing with textures, trends and items from all different time periods makes for a space that is aesthetically appealing and interesting; full of stories. Your eye will travel through this space with such wonder moving from the different materials. So have you checked out Chairish yet? If not, I warn you…you’re going to get lost in all they have to offer. Enjoy!